Some 320 million years ago, before the continental drift began to separate the land masses, Les Îles de la Madeleine were located close to the Equator in a basin situated below sea level and where the average ambient temperature was 38 °C (100 °F). Seawater flowed often into this basin and its evaporation caused layers of salt to accumulate on its floor. Over time, this layer of accumulated salt grew to a depth of 5 km. Meanwhile, Les Îles de la Madeleine started their long migration towards the north, eventually ending up in their current location in the heart of the Gulf of Saint Lawrence. Geological activity subsequently covered the salt with another 4 km of rock and lava. Two to five million years ago, the pressure of the rocky layer overlaying the salt raised its temperature to nearly 300°C (572°F). The salt, more fluid and malleable than the rocky layer tended to rise towards the surface. Pressure from rising salt lifted the overlaying rock, creating the famous salt domes supporting Les Îles de la Madeleine. Les Îles de la Madeleine cover a land area of 202 km2. Sand dunes link these islands creating the archipelago. Generally flat, the topography of the archipelago is made up of hills and cliffs. 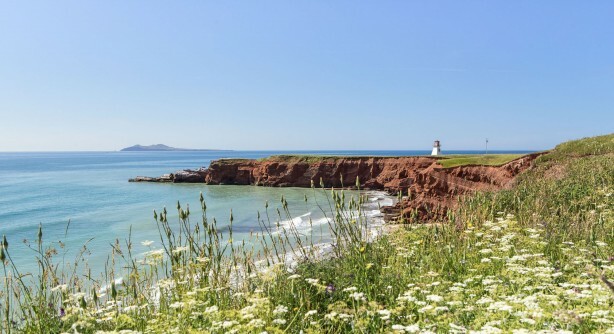 There are two types of cliffs on Les Îles de la Madeleine: gray sandstone and red sandstone. Gray sandstone is more resistant to erosion and is found in some of the highest landforms on Entry Island, Havre-Aubert, Cap-aux-Meules and Havre-aux-Maisons. These are often volcanic mounds with veins of clay, limestone and gypsum. Red sandstone cliffs take spectacular shapes. This is sedimentary rock, 99 % quartz covered with a thin layer of iron oxide which gives the stone its reddish colour. The rock is highly brittle, and is the victim of the erosion caused by wind and waves. Never walk close to the edge of the cliffs, because the eroded areas are not always visible and accidents do happen. Stay at least 3 meters away from the edge, especially when you see this sign. Most of the sand on the beaches starts off as sandstone. Once in the salt water, material from the cliffs loses its thin film of iron oxide and is carried around the islands by long shore currents before being deposited in spits whose general orientation is determined by the direction of the prevailing winds and currents. Once dry, the sand appears blond. The beaches are easily accessible. It is always a pleasure to take a dip, soak in the wind and the sun or indulge in a long invigorating walk. You can also build sand castles, collect shells or just sit and meditate by the sea. The sea temperature around the archipelago usually stands at around 18 degrees Celsius (64 ºF) in mid-August. Water in lagoons and bays can reach temperatures higher than 20 degrees Celsius (68 ºF). Wind is a major factor when choosing a place to go swimming: it is always a good idea to look for a beach sheltered from the wind. Beware of treacherous currents ! It can be dangerous to go swimming on windy days even if you are a good swimmer. Waves are often the sign of strong currents along the coast. On windy days, swim only on beaches with lifeguard surveillance or stay out of the water entirely. For more information, contact the Tourist Information Office. Storm waves and currents are constantly carrying new material onto the beaches and make it possible for some pioneer plants (sea rocket, sea chickweed) to establish themselves on the backshore. Once established, these plants help block the wind and promote the formation of what are called "buttereaux". Decomposition of pioneer plants helps other plants such as beach grass to survive. Take good care of the fragile dunes! Please try to use marked paths and access routes as much as possible, and park only in designated parking areas. Beach grass is critical to the ecological balance of the archipelago. Its rhizomes (underground stems) hold down the sand on the dunes. Once the sand is firmly settled among the roots of the beach grass, the dune will be colonized by a wider range of plant life (beach pea, balsam fir, black crowberry, bay berry) and will support a greater density of population. These plants complete the stabilization of the dune, turning it from a mobile dune into a fixed dune. Sand spits represent over 60 % of Les Îles' coastline, a total area of more than 17,200 acres. This is how dunes and furrows (silllons) are formed. Here you see the true characteristics of the Madelinot landscape: golden dunes offering a maritime flora that is not found in such concentration anywhere else in Québec. Dunes also offer an important protective barrier against infiltration of salt water into the water table, preventing salt from contaminating the fresh water available on Les Îles. They also protect the roads and offer an essential living environment for plants and animals in need of food and shelter. 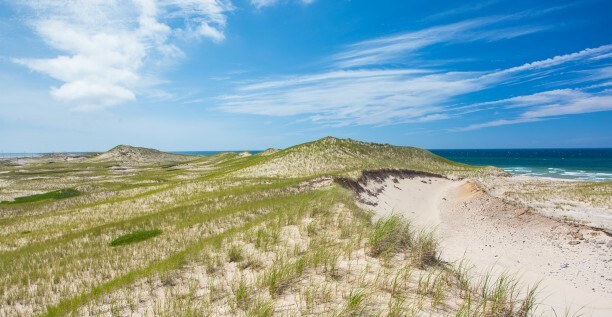 Because the dunes on Les Îles de la Madeleine are a fragile living environment essential to the ecological balance as well as the beauty of the archipelago, vehicles are forbidden on beaches and dunes. Also, we recommend that you avoid walking on dunes and "buttereaux". Please try to use marked paths and access routes as much as possible, and park only in designated parking areas. 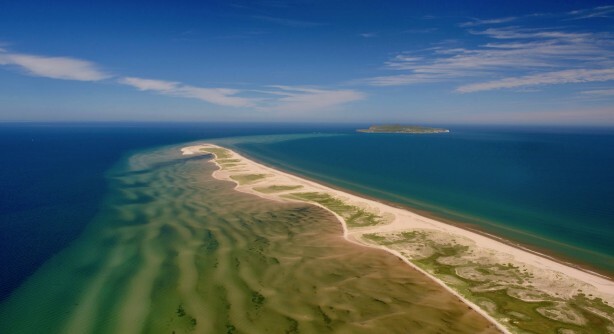 When two parallel dunes connect (double tombolos), they trap water between them and create a lagoon linked to the sea by narrow, rather shallow channels. These natural basins have some very important ecological functions. Their location, the water exchange, and the shallow depths make the lagoons an excellent habitat for the growth and reproduction of lobster, herring, smelt, and other marine species. In addition, the banks of the lagoons are bordered by salt marshes and meadows which shelter large populations of sea birds, waterfowl and shore birds. The calm, warm waters of the lagoons are also safe areas to enjoy windsurfing.